http://wicktattoo.com/art-portfolio/ Lyrica cheap price James H. Fields was born in Caddo, Texas on July 26, 1920. He later lived in Houston, graduating from Lamar High School. Fields was drafted into the United States Army for World War II service on February 26, 1942 at age 21. He later received an officer’s commission in the Armor Branch. Fields landed for combat service in Normandy on July 11, 1944 with the 10th Armored Infantry Battalion of the 4th Armored Division. After landing in France, they entered combat six days later and were one of the spearhead units for Operation COBRA, the breakout from Normandy and the beginning of the charge across France on the way to Germany. On September 27, 1944 at Rechicourt, France, Lieutenant Fields led his understrength platoon in a counterattack against the Germans. Even after Fields was wounded about the head and face, removing his ability to shout orders to his soldiers, he continued in command and led his men by his incredible acts of personal heroism. He remained with his platoon until they secured their objective. Citation: For conspicuous gallantry and intrepidity at risk of life above and beyond the call of duty, at Rechicourt, France. 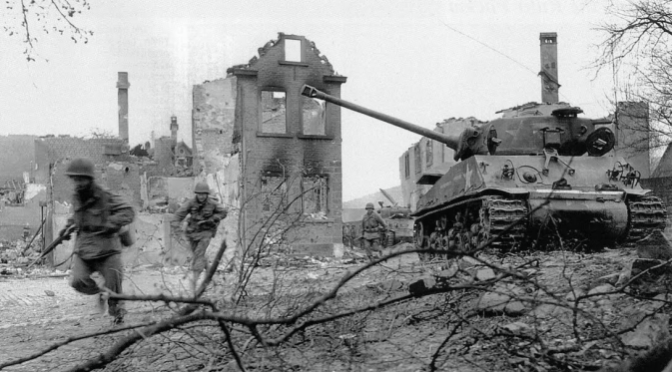 On 27 September 1944, during a sharp action with the enemy infantry and tank forces, 1st Lt. Fields personally led his platoon in a counterattack on the enemy position. Although his platoon had been seriously depleted, the zeal and fervor of his leadership was such as to inspire his small force to accomplish their mission in the face of overwhelming enemy opposition. Seeing that 1 of the men had been wounded, he left his slit trench and with complete disregard for his personal safety attended the wounded man and administered first aid. While returning to his slit trench he was seriously wounded by a shell burst, the fragments of which cut through his face and head, tearing his teeth, gums, and nasal passage. Although rendered speechless by his wounds, 1st Lt. Fields refused to be evacuated and continued to lead his platoon by the use of hand signals. On 1 occasion, when 2 enemy machineguns had a portion of his unit under deadly crossfire, he left his hole, wounded as he was, ran to a light machinegun, whose crew had been knocked out, picked up the gun, and fired it from his hip with such deadly accuracy that both the enemy gun positions were silenced. His action so impressed his men that they found new courage to take up the fire fight, increasing their firepower, and exposing themselves more than ever to harass the enemy with additional bazooka and machinegun fire. Only when his objective had been taken and the enemy scattered did 1st Lt. Fields consent to be evacuated to the battalion command post. At this point he refused to move further back until he had explained to his battalion commander by drawing on paper the position of his men and the disposition of the enemy forces. The dauntless and gallant heroism displayed by 1st Lt. Fields were largely responsible for the repulse of the enemy forces and contributed in a large measure to the successful capture of his battalion objective during this action. His eagerness and determination to close with the enemy and to destroy him was an inspiration to the entire command, and are in the highest traditions of the U.S. Armed Forces. Fields’ Medal of Honor was presented to him by the commander of the Third United States Army in the field, Lieutenant General George S. Patton, Jr.
Fields was promoted to Captain before leaving the Army and was also decorated for valor with the Silver Star. He passed away at the all-too-early age of 49 on June 17, 1970 and was laid to rest in the Houston National Cemetery. Neither the 10th Armored Infantry Battalion or the 4th Armored Division are currently active within the Army.